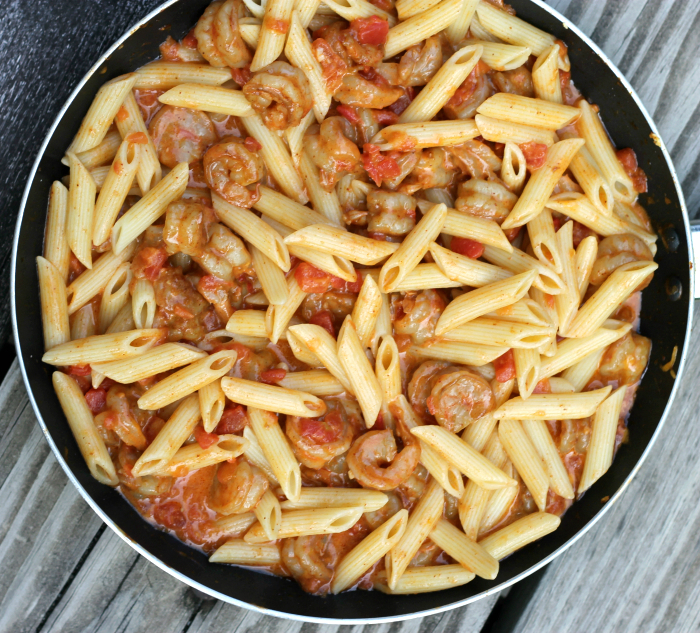 Taco shrimp Pasta… shrimp with the taste of tacos, but instead of the tortilla shell, its pasta. I hate Mondays!! There I said it. It’s something about the first day of the week or maybe it’s just that the weekend is way too short. I always have so many things that I want to accomplish over the weekend and it never seems to work out. And then Monday rolls around and there I am stuck again without getting all the things done that I planned on accomplishing. I am always happy to see the end of the work day when Monday rolls around… Tuesday is much better. Well enough of my ranting and raving about Mondays. Shrimp will actually bring a smile to my face any day of the week, even if it is a Monday. I wanted to make shrimp with a taco flavor, but I didn’t want to include tortilla shells to the menu, since there was none in the pantry. I had several boxes of pasta in the pantry. Sometimes you have to go with what you have. It is a simple recipe and comes together quite quickly. The taco flavors go well with the pasta. 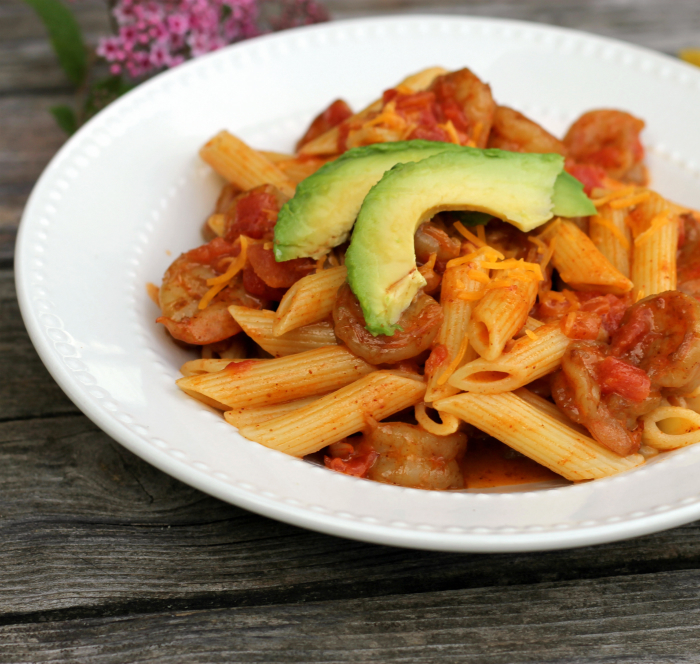 The cheddar cheese and the diced tomatoes make this creamy sauce that goes perfectly with the taco shrimp and pasta. The shrimp is tossed with chili powder and cumin and then cooked in olive oil along with some garlic. When it is to the point that the shrimp is just about done, the diced tomatoes and cheddar cheese are added. Let the cheese melt, toss in the cooked pasta and your dish is ready. 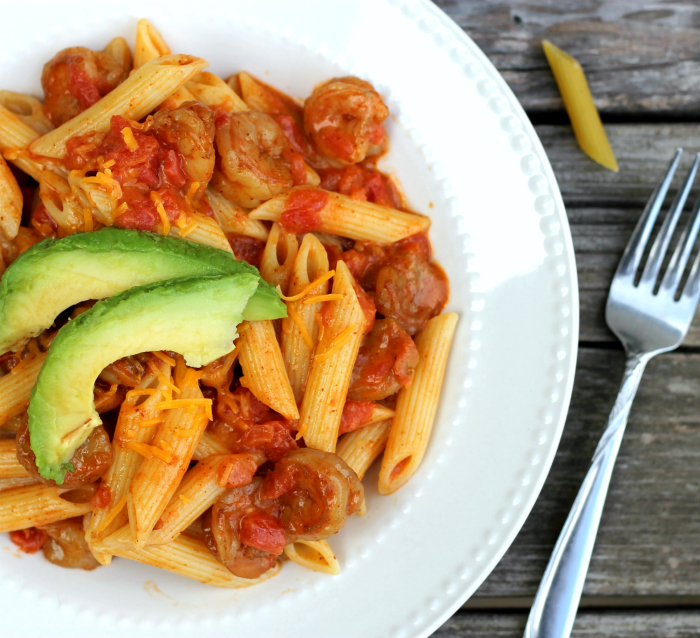 No need for tortilla shells for this one, the pasta is perfect. Toss cleaned shrimp with chili powder and cumin. Add enough olive oil to light coat the bottom of a skillet. Add the garlic and coated shrimp to the skillet Cook over medium heat until shrimp are just about completely cooked through (completely opaque and pink). Add the tomato sauce and cheddar cheese. Melt the cheese and continue to cook shrimp until done. I love it ! Look delicious!! Haha.. I also hate Mondays! If I had this pasta though, I think I could make it through. Monday isn’t my favorite day of the week, either. They stink! Anyway, this is such a fun dish — really good flavors presented in such a creative way. Good stuff! Thanks. 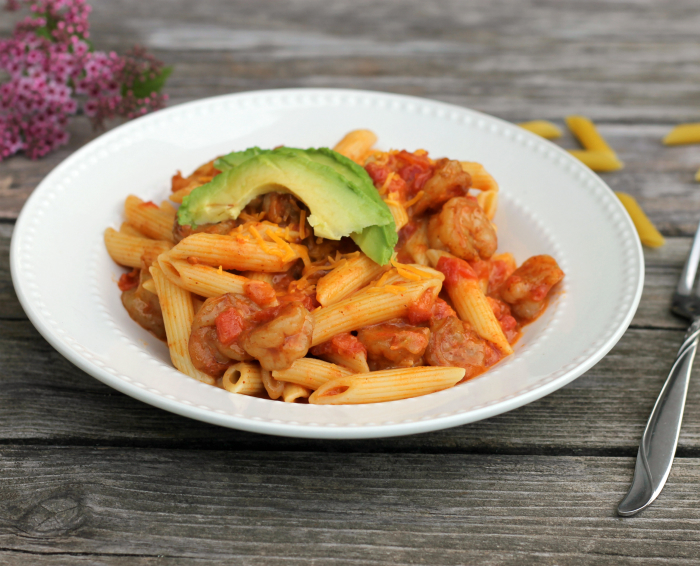 What a great idea – tacos & pasta together. It looks terrific! Great adaptation of the recipe.